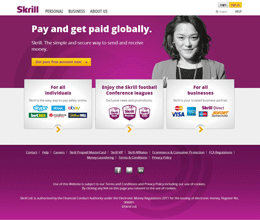 Open a Skrill account now and get €10 bonus! Skrill and FlashScore.com have now teamed up with a great offer. Receive €10 BONUS on your 1st deposit with Skrill if you register now for a free Skrill account. Exclusively for FlashScore.com members, transact €3,000 or more within a 30 days period and you not only get Skrill VIP status, you also get up to €100 bonus. This offer applies for existing Skrill users as well.